Matteo Renzi, the Prime Minister of Italy, quite self-consciously made Silicon Valley the first stop of his first official American visit: “not New York, not Washington, not Boston,” Renzi pointed out, somewhat undiplomatically, to his audience at the Council on Foreign Relations, in New York, a decidedly more staid group than the ones that he had met at places like Google and Twitter. (The Italian Prime Minister is an inveterate tweeter.) Renzi has a sense for political theater. He had surprised his New York hosts, who had prepared for simultaneous translation and passed out headphones to the overflow crowd, by giving his talk in English—a charmingly imperfect but workmanlike English, somewhat in the spirit of the American appearances of his fellow Tuscan Roberto Benigni. Renzi insists that greater flexibility in the workplace is necessary to energize the stagnant economy in Italy, where unemployment currently sits at 12.6 per cent (and at forty-three per cent among the young). To many on Italy’s left, his effort to change the law is further proof that, although technically the leader of Italy’s center-left Democratic Party, he is nothing more than a conservative in disguise, whittling away at what protections Italy’s workers still have. “Renzusconi” is the moniker for those comparing him to his predecessor, Silvio Berlusconi. Renzi, an extremely deft communicator in the age of social media, is acutely aware that Renzimania—the enthusiasm that brought him into office in February—can quickly turn into Renzi remorse. There is little doubt that the Italian system as a whole is sclerotic, slowed by an excessive number of laws and regulations, which are used by members of a parasitical political system to advance favored projects, block others, and, not infrequently, to line their own pockets. Italy ranks a rather dismal sixty-fifth on the World Bank’s annual ease-of-doing-business survey; it has dropped twenty places in the past ten years, falling behind Bulgaria, Botswana, and Belarus. It takes eleven hundred and eighty-five days to enforce a contract in Italy, closer to Angola (twelve hundred and ninety-six days) than France (three hundred and ninety-five), New Zealand (two hundred and sixteen), or the United States (three hundred and seventy). Italy is suffering from a significant brain drain, in which, during the past twenty years, hundreds of thousands of its brightest young people have sought their fortunes elsewhere–there are between five thousand and six thousand in Silicon Valley alone. They have good reasons to leave. The Italian labor market, with roughly twenty-two million workers, is split almost in two, between highly protected employees who can virtually never be fired and a growing number of mostly younger workers who live precariously off of temporary job contracts, which often pay around a thousand euros (fourteen hundred dollars) per month. As a result, many Italians live with their parents throughout their twenties and well into their thirties, hoping to save enough money to marry and have a place of their own—hoping, too, for one of those permanent jobs known as il posto. Renzi has denounced the current system as a kind of “apartheid,” and insists that his reforms will end it. But some critics maintain that his proposed changes will not actually make things work better. In its initial form, Renzi’s proposal would not affect existing workers, only those hired from this point forward, meaning that it would not help much to eliminate dead weight, and would make the position of younger workers even more precarious. Unions in Italy are offering a compromise that would allow companies to hire and fire freely within the first three years of employment, but which would then grant the standard protection granted to other Italian workers. One can imagine, however, that this would encourage businesses simply to cycle through a new group of employees every three years. “How do you say acciaio?” Renzi asked cheerfully. “Steel! 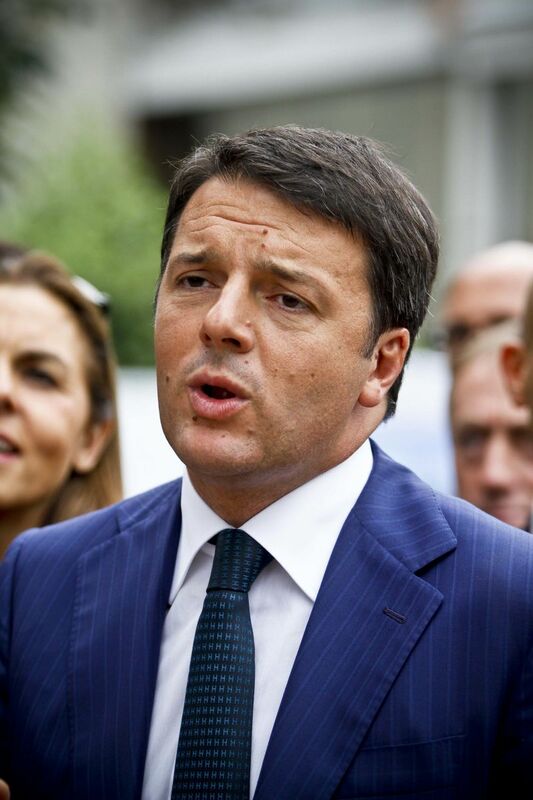 Steel!” Renzi mugged, looking puzzled and amused.